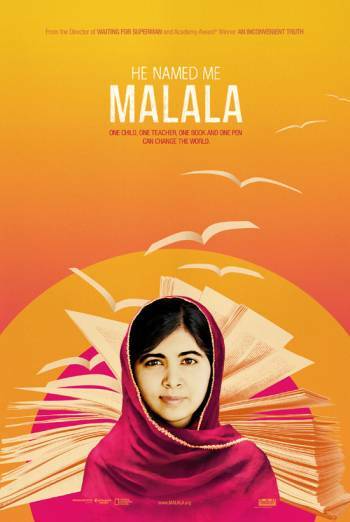 Summary HE NAMED ME MALALA is a documentary about Malala Yousafzai, the Pakistani schoolgirl shot and seriously injured by the Taliban, who has since become a potent advocate for the education of girls and the co-recipient of the 2014 Nobel Peace Prize. HE NAMED ME MALALA is a documentary about Malala Yousafzai, the Pakistani schoolgirl shot and seriously injured by the Taliban, who has since become a potent advocate for the education of girls and the co-recipient of the 2014 Nobel Peace Prize. Archive footage showing a puddle of blood and a piece of bloodied cloth on a street accompanies a reference to the Taliban shooting people in a square. There is then relatively undetailed sight of a body in the back of a pickup truck. Another sequence shows the bus in which Malala and her friends were shot. There is blood on some of the seats, together with streaks of blood on the outside of the bus. Other issues include verbal accounts of the shooting and the injuries suffered by Malala, together with undetailed footage of her first in the operating theatre and then undergoing physiotherapy as she embarks on the road to recovery.